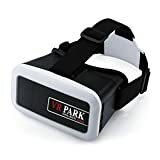 Over 300 virtual reality apps on iTunes App Store and Google Play Store for you download to enjoy thrilling Virtual Reality You may benefit from Our 4th Gen VR Headset High Definition Videos and Games Industry-leading High Definition Aspherical Lens are used to reduce distortion-simultaneously protect you from dizziness. 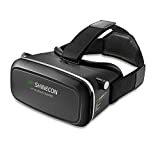 It features: *HD Visual *Dazzle barrier *Durable and easy to clean *UV400 protection *Sense of comfort Easy to Use Simply put your smartphone inside the headset and you are ready to go. The magnetic trigger will lock tight to prevent phone from dropping and the soft material will protect your smartphone from sractching. Compared to the 1st gen, you do not need to clamp your smartphone with clips, which may cause inconvenience by hitting the volume or power button inadvertently. In addition, the Open-cells Design is good for cooling of your phone. Comfort fit Leather is used for comfortable wearing. Adjustable head strap ensure a comfort fit for every person from teens to adult. Technical Specifications Labor Material: ABS+ PC Headband Material: Nylon Cache Material: Leather + Memory Foam Lens: PMMA Lens Lens Transmittance: DIA 42mm non- spherical optical lens View Angle: 70-90 degree Item Size: 195x100x130 mm. 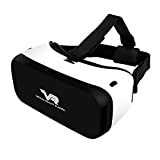 Leave your world behind Journey to a new reality and experience the latest innovative and exciting tech - 3D virtual reality, where the possibilities are endless. This is a fun, affordable, entry level headset to introduce you to the world of 3D reality. We offer 45 days money back and 12 month hassle-free warranty to any product purchased from VersionTech. Plus friendly customer service, you can buy with confidence. Living, Breathing Movies Experience the magic of the cinemas without leaving your room. 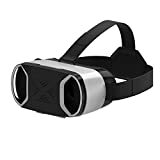 Insert your iPhone, Android or Windows smartphone into the headset and transform the small screen into a panoramic private theatre showcasing 3D films or videos with 360°interaction. Launch Pad Explore fantasy worlds with an ever-growing library of VR content from the Apple App and Google Play Stores. You can also enjoy fully interactive 3D videos from YouTube or dedicated VR websites. 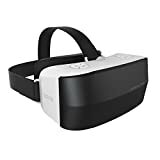 Reality Check An entry-level, straightforward VR headset for people making their first virtual dive; All you need is a smartphone and the curiosity to explore. Focused Fun Nearsighted? Dizzy in front of a screen? No worries! The adjustable pupil distance (2.3"-2.8") and focal distance (-0.2"- 0.2") protect against eye strain, giving you hours of endless fun and a relaxing way to enjoy your virtual world. Long Term Enjoyment The headset has been designed to maximize comfort by having a soft sponge casing around your eyes to lighten pressure on your face for hours of use without stress. 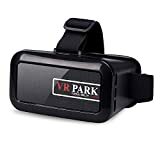 Wide Compatibility The Virtual Reality headset supports all popular smartphones with a width between 3.5" - 6". Explore into a new reality and experience the world like never before! 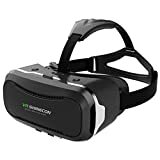 The VersionTech virtual reality goggle is an entry-level VR headset for both technology early adopters and the casual customer looking to explore the hottest new technology this century.